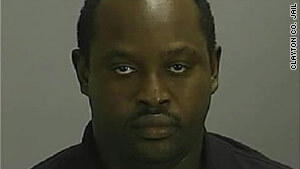 Mundy's Mill High School teacher Randolph Forde has been charged with making terroristic threats and is out on bond. Atlanta, Georgia (CNN) -- A suburban Atlanta high school teacher has been accused of pursuing a "hit" on a 16-year-old student last month, and the case is under investigation by local authorities. Randolph Forde -- who teaches at Mundy's Mill High School in Clayton County -- has been charged with making terroristic threats and was released on bond. He is currently on administrative leave from his job with pay and faces an employment hearing in early December, Charles White, a school district spokesman, said Tuesday. A Clayton County Police report says the incident occurred October 9. The suspect took a student off a school bus and told him he "would pay him to kill the victim," the report says. When the student asked who the target would be, the suspect said he'd write the name on a note, it says. "The teacher held a piece of paper up with the victim's name on it," said Officer Otis Willis III of the Clayton police. Attorney Terance Madden, who represents alleged target and his family, issued a statement saying that problems between the boy and the teacher go back to "on or about September 29," when "Forde allegedly called my client outside the class and asked him if he is gay." Then "on or about September 30," the two had an argument in class and Forde threatened "to hit him in his 'effin mouth," Madden's statement said. "Not only did my client report the verbal altercation and verbal threat to the vice principal of Mundy's Mill HS, he also reported that Mr. Forde asked him outside the classroom for the inappropriate question of whether he was gay," the statement said. "Apparently nothing was done by the school administration to either Mr. Forde or my client, because Mr. Forde was back in the classroom on October 1, as was my client." Madden said the school didn't take any action until after a police report was filed on October 12 about the incident. "This forced my client's mother to have to remove my client from the high school, depriving him of his education because of fear for my client's safety at Mundy's Mill HS," Madden said in the statement. "Finally Mr. Forde was allegedly removed from the school after the police report was filed and my client was able to return to school. An arrest was made on or about Oct. 14. Mr. Forde bonded out on $10,000 bond and waived his preliminary hearing," Madden said. Charles White, the school district's spokesman, said the district had no comment on the allegations because the issue is a personnel matter and is under review. He said it would be "inappropriate" for the district to release any information about the case. "Attorneys can say anything they want," he said, but he added that "there are definitely multiple sides to any story." Forde's attorney initially could not be reached by CNN. The attorney was quoted by CNN affiliate WSB-TV as saying that Forde had been joking and didn't supply a name to anybody. White says there was to be an employment hearing Tuesday, but it had to be postponed because there had to be proper prior notice of a scheduled session under the state's open meetings law. District officials are aiming for a hearing in early December, he said. Madden calls the school district's reason for the postponement "bunk" and said it "doesn't even pass the smell test." He said the hearing was postponed because media coverage about the case had begun.